I am so happy today because I received a congratulatory call from my primary care physician regarding my A1c. My numbers are the lowest they have been since I was diagnosed with Type 2 diabetes. Pre-surgery, I was taking four types of injectable diabetes medicines. I poked myself several times a day to check my glucose numbers and injected myself with meds what felt like round the clock. My endocronologist suggested gastric bypass and I went to see doctors at the world renound Tufts Medical Center. The doctors encouraged me to have the surgery so that my insulin resistant diabetes would go into remission. My insurance refused to approve my surgery, because I was merely obese and not morbidly obese. My husband and I made the decision to travel to Mexico so that we could make gastric bypass possible. I have not taken any diabetes medication since I was discharged from the hospital. Nothing. Nada. Nyama. Two months after surgery, I threw away my meds and haven't looked back. I am officially in remission. I have lost 55+ pounds and I feel great. The best part of my remission is knowing that I will live longer and be around for my daughter. She won't know me as a sick person. She won't watch me struggle to keep up my diabetes med schedule. She won't be worried that I will have a foot amputated or lose my vision. My only regret is that I did not have this surgery sooner. There isn't anything I can do about the past but I have changed my future. If you are doubtful whether or not gastric bypass works, take my story seriously. Surgery and hard work pay off. Believe my story. It can happen for you. *I am editing this post to add a photo of my meter. 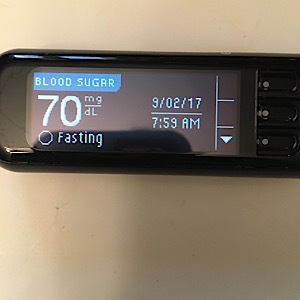 A measurement of 70 beats fasting blood sugars in the 200's! Because my pancreas is finally happy. Congratulations! That's HUGE. Improves your quality of life in so many ways! Good job! @Gretta Thank you. Today was a magnificent day. In fact, it's been a magnificent year! I feel so lucky. Great news NerdyLady. Maybe you should send a gloating letter off to your insurer making sure they realise how wrong they were!!! I'd like this a million times over if I could! Wow - what wonderful news!! You are living proof of the life changing power of weight loss surgery. Time for a happy dance. Sooo happy to hear this news! And shame on your insurance company for not wanting to "treat/beat" the diabetes with WLS. To each of you, I send a heartfelt thank you. I was terrified that diabetes was going to end my life. Many years ago, I had a retinal detachment and I have partial vision in my left eye. For the past few years, i have been petrified that diabetes would leave me completely blind. WLS has given me many gifts but my diabetic remission is the best outcome I could have asked for. The benefits of WLS go far beyond the number on the scale. You brought a happy tear this morning - congratulations. Thanks @cinwa and @Sleevalicious! I'm thankful to be able to tell this story.